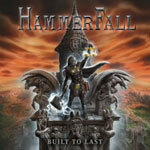 The Swedish metallers HammerFall continue their fight for heavy metal. The album's thread is pretty much an "Us against the world" kind of story with hopes and desires for fellowship and affinity within our own world of heavy music. Hammers and swords are swung, past and dark times are there and steel and metal are the words of the day. Well, you get the point, but still I think that those type of lyrics are what the fans want from this unit and I assume that it's making it into a win/win situation for the band and its crowd in the end. and the same goes for the musical side of the record too, as they have on the contrary in the construction of the songs interlaced quite a lot of the attributes from the early days of the band. I think that they're quite successful in that department, even if they're not unfamiliar with that particular course of action, because on the last album, (r)Evolution, they were already starting to look back at what made them a force to be reckoned with in the first place. The guitar playing and especially the riffs are often high in the mix and clearly the band is trying to make this characteristic set the tone for the whole record. The band has in my opinion never put out a bad record, even if things were starting to get a bit repetitive there for a while in the late 00's and even if this isn't their absolute best effort over the years, it's still a very nice one and the spirit of HammerFall is once again making a clear statement to the metal community. Built To Last contains several great songs, even though maybe Stormbreaker will be the only future classic, but as usual there is one huge downside too, because they have, as always, decided to put a way too cheesy and lullaby-like ballad on an album again. If someone wants to listen to a song like Twilight Princess, wouldn't that person look elsewhere? Next! Skip! Or am I totally wrong and it's in their fans' view not that worthless and there's people who actually dig these type of songs wholeheartedly and want them on the albums? Joacim Cans is struggling just a little bit with his voice and he definitely dares to sing some high notes more than occasionally. The vocalist has before been getting some comments about his vocal performance and capacity, but I just have to look at my CD-shelves right here beside me to easily point out many metal singers who wouldn't even dream about coming out with stuff similar to this. It's not like I'm trying to overestimate his contribution to this record, but more just giving him a fair break, just like with anybody else. I think that Built To Last solidifies HammerFall's position as one of the best European heavy metal bands of the modern era. Speaking about modern, I just realized that it's been almost 20 years since the band's first record was out and calling them a new band still is soon about to get ridiculous. Anyway, they are to this very day, unlike most of the bands of the 80's, able to bring forth high quality records and as long as they keep doing that, they undoubtedly still deserve a lot of credit and recognition.